With its classic design, this beautiful, handcrafted, Spanish colonial style bed will be a wonderful addition to your Western décor. The bed has a wide, rectangular headboard built with a solid, timber frame. The top of the headboard has a lovely, crown molding, and below the molding are exquisite, hand carved, floral and scroll designs. The front of the headboard is enhanced with three, rectangular, padded panels, and each panel is covered with luxurious, dark, red, full grain leather. The panels are divided by two uprights, and the headboard is framed on each side with elegant, hand carved, floral and scroll designs. 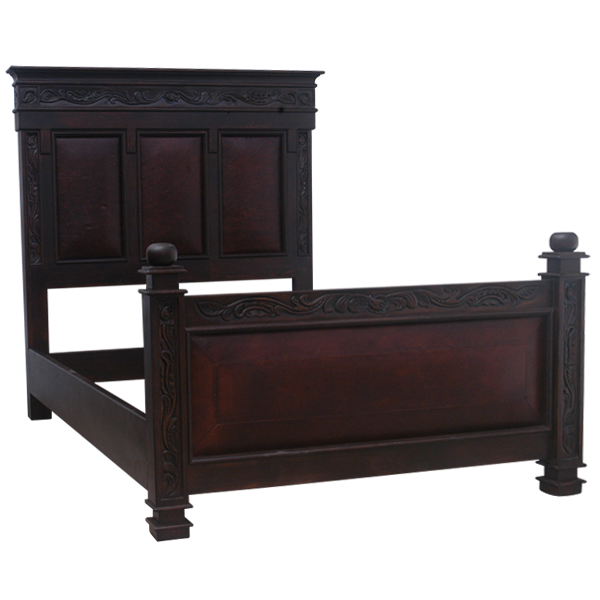 The bed has a wide, rectangular footboard, and the top of the footboard is embellished with graceful, hand carved, floral and scroll designs. The front of the footboard has a rectangular, padded panel, and the panel is covered with matching, dark, red, full grain leather. The junctions of the leather are double stitched together for extra strength and durability. The footboard is framed on each side by dramatic, solid wood uprights, and the face of each upright has gorgeous, hand carved, floral details. The top of each side upright is accented with a hand carved sphere, followed by geometric, hand carved details. The bed has solid wood, side supports, and it rest on geometric shaped, solid wood legs. It has an opulent, dark finish, and it is made with the best, sustainable, solid wood available. The bed is 100% customizable.